Pann: Which of these girl groups is the most stable for vocal? 1. [+92, -42] It's honestly Apink, their vocals are stable. If you listen to their MR removed videos, you'll see that they're all good. I don't need to explain Eunji. Listen to Namjoo's stage on Mask Best Singer, Bomi's Problem, Hayoung and Naeun's Gone Not Around Any Longer, and Chorong's Invitation. 2. [+87, -37] Isn't it Apink? Out of the 6 members, 4 members are completely stable. 4. [+37, -6] EXID is good at live. Hyerin is unexpectedly really good. 5. [+27, -8] Apink!! Apink is so underrated because only Eunji is known as a good vocalist. 6. [+21, -4] Definitely not AOA and Girl's Day. 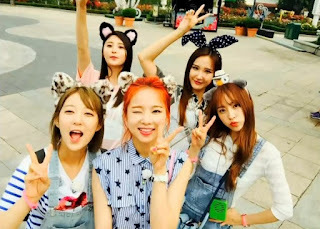 EXID is pretty talented but their MR removed videos show that the members don't sing a lot of parts. Hyerin's live is quite unstable. Apink for me. 7. [+19, -9] EXID's MR removed videos tell that their live is not that good. Solji doesn't sing the high notes. And if you search 'worst MR removed' on Youtube, you'll get results of Girl's Day's Something and Look At Me. 8. [+14, -14] Definitely EXID. I don't really like them but Solji is very talented and Hyerin is good enough to be a main vocal in other teams. LE is a top female idol rapper and Hani is good at singing. Junghwa lacks but she can sing her parts and she has a pretty voice. Is there only Apink fans here?